The partnership between the Miami Tribe of Oklahoma and Miami University began in 1972 when Miami Tribe Chief Forest Olds visited Miami University unannounced. Chief Olds said he wanted to see the University that shared the name of his tribe. President Shriver was away from campus, but staff from Alumni Affairs and Students Affairs hosted Chief Olds. Eventually, this relationship evolved into the partnership the Miami Tribe of Oklahoma and University share today. Find answers to common questions about this relationship. When was the Center created? The Myaamia Project was created in 2001. The Project transitioned to the Myaamia Center in 2013. Learn more about the Myaamia Center. The Myaamia Center is a tribal initiative located within an academic environment whose mission is to advance the Miami Tribe of Oklahoma's language and cultural revitalization efforts. 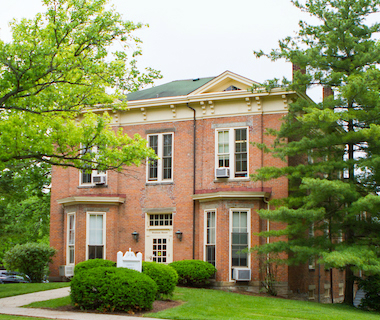 The Myaamia Center is located in the Bonham House on Miami University's Oxford campus. Where is the Miami Tribe located? The Miami Tribe is headquartered in Miami, Oklahoma. Citizens of the Tribe live all across the United States and internationally. When have leaders of the Miami Tribe of Oklahoma visited Miami University? Miami Tribe Chiefs have been invited speakers at four Miami presidential inaugurations, in 1993, 1997, 2006, and 2016. The Miami Tribe Chief spoke at Miami's 2009 Bicentennial Celebration. The leaders of the Miami Tribe were on campus for the opening day of the Miami University Art Museum exhibit about the Miami Tribe, September 2008. The leaders of the Miami Tribe were invited to campus for the visit of the Dalai Lama and also attended a very small reception for the Dalai Lama where they presented him with a handmade gift from the Miami Tribe. Leaders have visited classes, presented public programs about Miami Tribe history and culture, and assisted in bringing other guests to campus for programs. The leadership of the Miami Tribe have attended every Myaamiaki Conference since the conference first began in 2004. When have leaders from Miami University visited Miami, Oklahoma? A representative from Miami University has attended every January Winter Gathering and Stomp Dance since they began in January, 1996. Representatives from the Division of Student Affairs have attended every Annual Gathering and Pow Wow since they began in 2000. Presidents Shriver, Risser, Garland, Hodge, and Crawford have all visited the Miami Tribe in Miami, Oklahoma. Provosts, Academic Deans, and Department Chairs have been part of groups that have attended various cultural events sponsored by the Miami Tribe. How many Miami Tribe students attend Miami University? The number varies, but during the 2017-2018 academic year, 31 Myaamia students attended Miami University. The largest cohort, 32 Tribe students, attended Miami University during the 2016-2017 academic year. See Myaamia Students for details. How many Miami Tribe students have graduated from Miami University? Since students first enrolled in 1991, 70 Myaamia students have earned 72 degrees (66 undergraduate and six graduate degrees). Two students earned both an undergraduate and graduate degree at Miami. What's the graduation rate for Miami Tribe students? The four-year graduation rate for students who have gone through the Myaamia Heritage Award Program is 77.1%. How can I learn the Myaamia language? The Myaamia Center has created an online dictionary that serves as a resource for learning the Myaamia language. When should Myaamia words be capitalized? The Myaamia language does not use capitalization when written alone, but when Myaamia words are used within the context of English, Myaamia follows the same capitalization rules as English. Does the Myaamia Heritage Logo replace the Miami University logo? No. Both Miami University and the Miami Tribe of Oklahoma retain their existing symbols. The Myaamia Heritage Logo is a graphic element designed collaboratively to symbolize the relationship between the Tribe and University. Learn more about the Myaamia Heritage Logo and what its components mean. What is the national controversy surrounding the use of Native mascots? A national controversy has brewed for decades over the use of Native American mascots by athletic teams professionally and in academic settings. Increasingly considered derogatory and offensive, the mascot controversy found strong momentum in the late 1960s, following the birth of the American Indian Movement and efforts to address Native stereotypes by the National Council of American Indians. Some schools completely eliminated Native references, names, and mascots. Other schools sought a compromise in an effort to appease competing views among their constituents, alumni, and fans. Regardless of which route teams or academic institutions have taken, they have faced enormous difficulty grappling with the decisions. Finding consensus among all constituents has been rare. Miami University is no exception. As with many societal controversies, perspectives on best practices change over time. What is the Miami Tribe's connection to the mascot controversy at Miami? Miami University began using the Redskins mascot in the 1930s. By August, 1972, when Forest Olds, Chief of the Miami Tribe, unexpectedly visited the University for the first time, discussion about the appropriateness of the Native mascot use had already begun. In 1972, Chief Olds stated he had no objection to non-derogatory use of the term Redskins, but that he did not "see where Redskins pertains to Miamis only, to me it covers all Tribes." After his visit to campus, University administrators wrote a resolution endorsing use of Redskins and sent it to Chief Olds and the Miami Tribe. After substantial discussion, the Tribe passed the resolution. In subsequent decades, the Tribe and the University cultivated a close relationship, even as the national controversy around Native mascot issues continued to draw attention and ignite discussion about the topic on Miami’s campus. By the mid-1990s, public perspective on the use of the Native mascots had changed significantly, including among members of the Miami Tribe. Did the Miami Tribe request the University's mascot name change? Yes. In July, 1996, the general membership of the Miami Tribe of Oklahoma passed a resolution asking the University to stop using the Redskins mascot. THEREFORE, BE IT RESOLVED that the Miami Tribe of Oklahoma can no longer support the use of the nickname Redskins and suggest that the Board of Trustees of Miami University discontinue the use of Redskins or other Indian related names, in connection with its athletic teams, effective with the end of the 1996-97 academic school year. In September 1996, the Miami University Board of Trustees voted to discontinue the use of Redskins out of respect for the Miami Tribe. Members of the University community also began working to determine a new mascot. How and why was RedHawks chosen as the Miami mascot? After soliciting 3,000+ name suggestions from students, faculty, staff, and alumni, the University's Athletic Nickname Selection Committee, chaired by President Emeritus Phillip R. Shriver, set about selecting a new mascot for Miami University. The Committee sought a name that could be related to Miami’s heritage, the association with the Miami Tribe of Oklahoma and one that would not be offensive to Tribe members or other persons. They studied several final options for linguistic analysis, legal difficulties with other trademarked items, marketing advantages, and public relations risks. President Garland eventually recommended RedHawks to the Board of Trustees, who unanimously adopted RedHawks on April 18, 1997. The name "RedHawk" was favored because the name is derived from the red-tailed hawk, a real animal that is indigenous to both Ohio and Oklahoma and that shares the school colors (red tail, white breast). As a predator with a reputation for being fierce, strong, and soaring, the hawk conveys the kind of competitive spirit appropriate for athletics. How can University students, faculty, and staff become involved in the Miami Tribe of Oklahoma or Myaamia Center programs? Learn more about the Miami Tribe of Oklahoma, Miami Tribe Relations, and the Myaamia Center. Opportunities typically include class visits and/or class assignments, participating in a variety of campus programs, and attending the biennial Myaamiaki Conference, a day-long on campus conference that presents research topics about the Miami Tribe. Limited opportunities exist to visit Miami, Oklahoma for Miami Tribe cultural events. Check out the information about the relationship in the Armstrong Student Center's Shade Family Room and the Smucker Wiikiaami Room. For information about ways to engage with the Miami tribe, contact Bobbe Burke, Coordinator of Miami Tribe Relations. What have been the outcomes of this partnership? Diversity education is enhanced by exposing current students to information about one of the 567 American Indian Tribes that are federally recognized in the United States. Several faculty members have created class assignments to meet needs identified by the Miami Tribe. Anthropology was the first class to offer a field study summer experience in Miami, Oklahoma for students. Other Oklahoma field studies have been in Linguistics, Archeology, Journalism, Geography, Environmental Science, Mass Communication, and Business. Journalism students assisted in the first printed newspaper of the Miami Tribe in June 1998. Five different Architecture Cultural Design Studios created projects for the Miami Tribe, including the conceptual design of the Armstrong Student Center Wiikiaami Room. Computer Science classes have created online interactive projects and database systems for the Myaamia Center. Nursing students offered two Winter Term classes (2014 and 2015) that included a one week stay in Oklahoma doing service projects for the Miami Tribe. Several special student Spring Break trips have occurred in Miami, Oklahoma. Since 1991, more than 120 Myaamia students have taken advantage of college educational opportunities at Miami University through the Myaamia Heritage Award Program. The Myaamia Center was created as a campus space where concentrated work occurs that enhance the language and cultural revitalization of the Miami Tribe. Tipeewe neeyolaani (pronunciation): It is good to see you.